In today's Game Informer behind the scenes video they have a lot of the Disney Infinity 3.0 Star Wars classic figures, and a few from the Prequels, shown and a little game footage such as the space battles with the Millennium Falcon and an X Wing. I also saw Mulan in there as well. But what intrigues me the most, is the fact that my all-time favorite character might end up being playable. 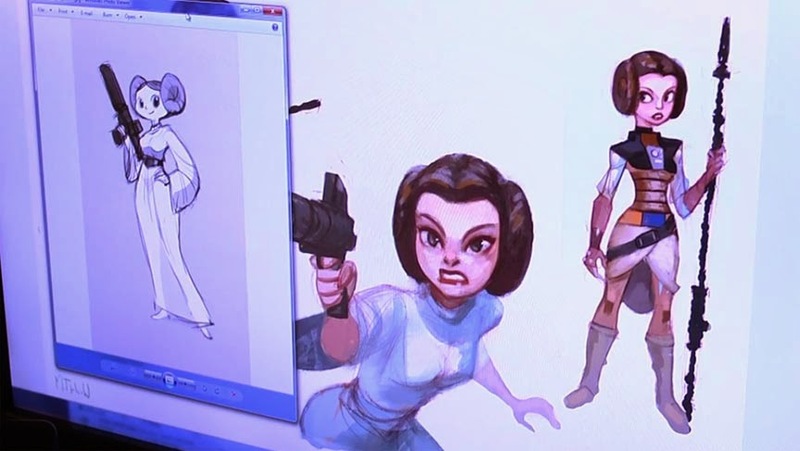 In the video when they are talking about designing Leia there are numerous pictures, and a couple of them are her in the Boushh disguise. Sure, she doesn't have the helmet on, but if it turns out to be a costume Power Disc, I'll buy it instantly anyway. My excitement is unbelievably ridiculous right now. Also- her hair should be pulled back in that costume, not in the classic cinnamon buns.